"Great book. Kevin and I watched the movie and it was also fantastic. Unique concept. Excellent execution." 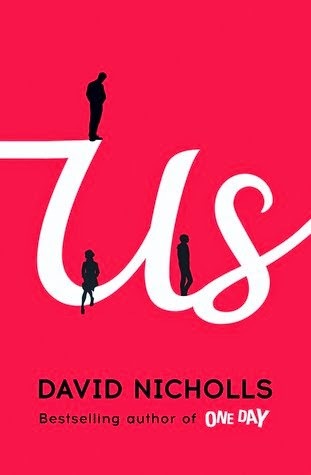 I have to reiterate much of the same sentiments for Nicholls's newest novel, Us. I had the pleasure of reviewing this book for TLC Book Tours. When I saw this novel on the list for fall book tours, I immediately knew I wanted a chance to read it. I had seen a bit of advertising or reporting on the fact that Nicholls had a new novel coming out, but I knew very little about it. Other than, of course, the fact that I had liked his previous book. Since that is more than enough to convince me to read another book by an author, I jumped at the chance to get my hands on this one. 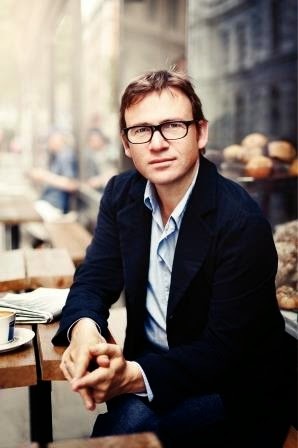 Rather than give you a plot summary of the book, I'll let David Nicholls do that himself. TLC sent me this great little video by Nicholls giving a brief explanation of the book. It's always fun to see an author's own take on their work and who can describe it better than him? Take 90 seconds, unless you're at work, of course, and hear about the book straight from Nicholls himself. The same words I used for One Day years ago really do fit perfectly again: "Unique concept. Excellent execution." Nicholls has a remarkable ability to take very ordinary situations and make them feel fresh and unique. Really, the book is about a disintegrating family, but his writing gives the scenario a feeling of discovery. You care about these characters and they are so human in their thoughts and actions. None of them are perfect - far from it - and yet they are not caricatures either. Perhaps with the exception of accordion-playing Kat, but she's a supplemental character, so I'm not counting her amongst the core three family characters. I definitely recommend this book. Nicholls writing is fantastic and he handles heavy emotions with humor, grace, and truth. The story moves quickly as our main character traverses Europe with (and without) his family. Each city is filled with all the charm you'd except and Nicholls weaves in art beautifully to the story. In a way, it reminded me of The Goldfinch, which I'm currently reading. Art and life joining together to tell a beautiful, if sad, story. I did also appreciate that Nicholls tells his story, but doesn't get excessive or gritty with details. It would have been easy enough to turn a few scenes into romance novel moments, but he refrained. The deferment fit so well with his narrator, who wouldn't be the type of person to share such intimacies anyway. If you can get your hands on a copy of this book, do it. It's worth reading and will cause you to reflect on family and love and life. I'm anxious to hear some others' thoughts on the ending, as well. I found it surprisingly satisfying. Let me know your thoughts! I'm thrilled to see that you enjoyed this book just as much as his last. It sounds like a thought-provoking read!